PRODUCT: ASI 703319, 1-1/4 inch Retro Split-Collar Pipe Storm Collar. 1.66 inch ID fits 1-1/4 inch nomimal size & DN 32 pipes. Includes Stainless Steel clamp. Price/Each. Fits 1.375 to 1.66" OD (1-1/4 series) and DN32 pipes. The EPDM Retro-Collar consists of two pieces of thick UV resistant molded black EPDM Rubber. 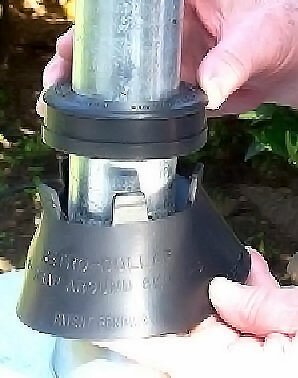 Each piece wraps the pipe, snaps closed around the pipe, then interlocks to each other to form the waterproof system. Bottom is 5-1/4" OD. Overall height about 3-1/2". 1-1/4 inch Retro-Spin® / Retro-Collar Kit. 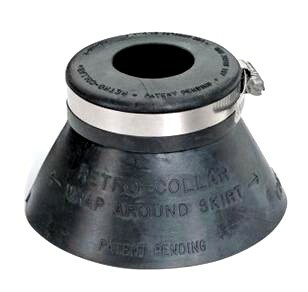 Galvanized steel Retro-Spin Flashing base, 1.66 ID EPDM Retro-Collar Assembly (wrap-around flashing skirt + top plug), & stainless steel band clamp. Fits pipes 1.25 ID or 1.5 to 1.6 OD & DN32 pipes. Price/Kit.